Some traditions carry on long past their expiration date. Usually it’s because it’s just the way it’s always been done, without necessarily a thought as to why. 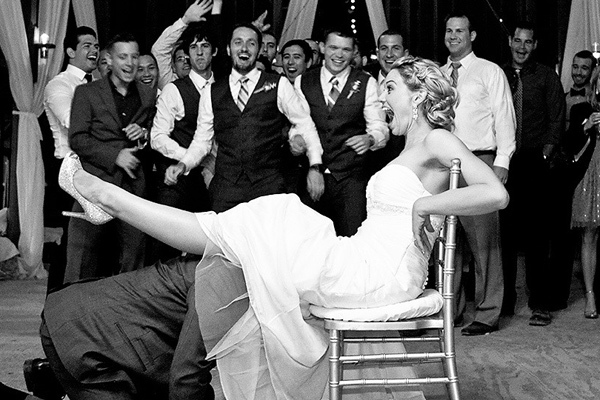 In other cases, the traditions are fun, or part of what the bride has always imagined. Most of these traditions are totally sweet, and are done at just about every wedding for a reason. Even if there are elements of your wedding that have iffy beginnings, it can still be a sweet addition to your wedding. But for those who may want to change things up a bit, here’s a guide to which traditions you don’t have to be married to. 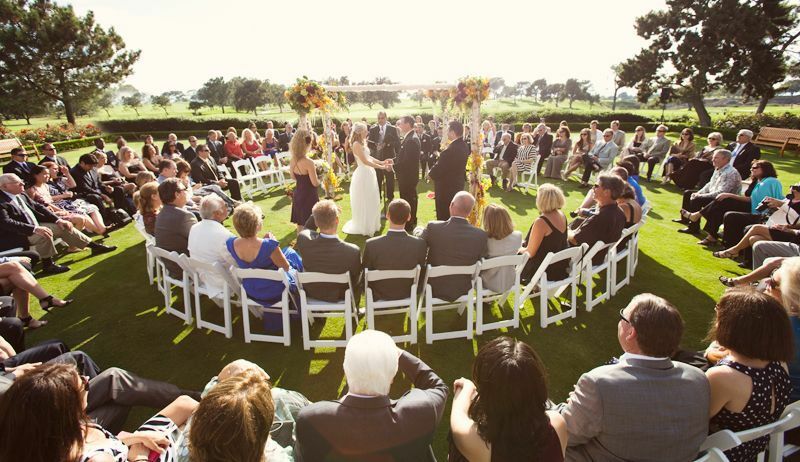 More ceremonies have discovered “in the round” seating, which puts your guests surrounding you as opposed to all on one side. This works especially well if you don’t have a particular view or focal point of your venue, and allows you to be fully surrounded by all the people you love. Brides have been beautiful in dresses of every shade. Look, it’s your family and friends—they’re gonna know who the bride is. If you’re looking for something to set you apart from other brides, and certainly a dress that all your guests will remember, choosing a color other than white is a great option. And because you can find dresses in shades other than white that aren’t specifically wedding dresses, they’re often hundreds (or thousands) of dollars less expensive. This might be a tough pill for Dad to swallow, but if you feel weird about your father “giving” you to your new spouse, reconsider the walk. One option is to have both your parents walk you down the aisle, or just your mom (since Dad gets the dance later anyway). This is our terrible 21st century American version of a dowry. In essence, your parents are transferring the responsibility of financially taking care of you from them to your husband and his family, so they pay for the wedding to sort of make up for that. Offended? You should be. Who pays for what is an intensely personal decision, and if your husband or his family assumes that you and your family should be paying for the wedding based on this tradition (and not on other personal factors), send them my way so I can slap them silly, please. I can’t imagine anything more embarrassing than having my new husband dive underneath my skirt to remove an undergarment in front of my grandmother and then throw it to his buddies…except for maybe being a guest at a wedding and fighting other women for the bouquet. You can skip both of these. Your friends are likely made up of different genders, and your bridal party can be too. His sisters don’t have to stand on your side, and your male buddy from college doesn’t need to stand on his. Take a cue from the above wedding and let the groomswomen dress like the bridesmaids, and the bridesmen dress like the groomsmen. It’s totally unnecessary for you to say the vows recommended by whatever church you follow (unless your church requires it), or the nondenominational vows if you aren’t religious. 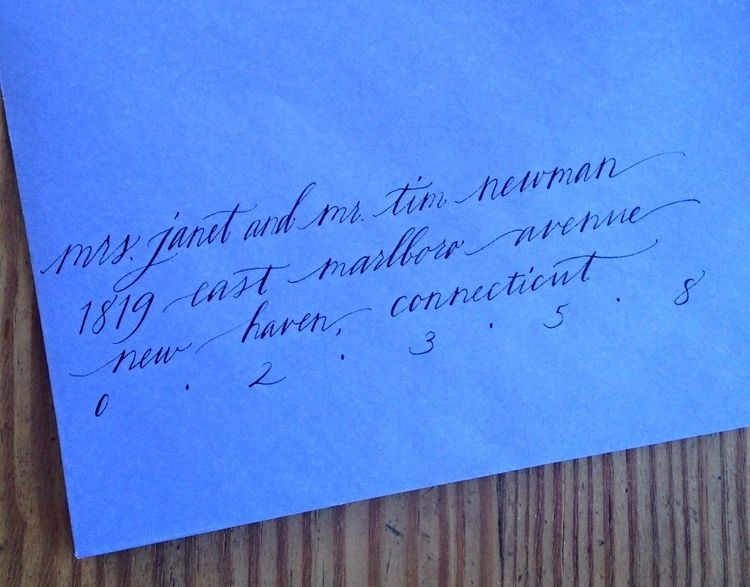 Write your own, skip “I do,” sing a song, have a Twilight-length makeout sesh, whatever you need to feel married. I attended a wedding where the groom’s side was full of people and the bride’s side was depressingly sparse. 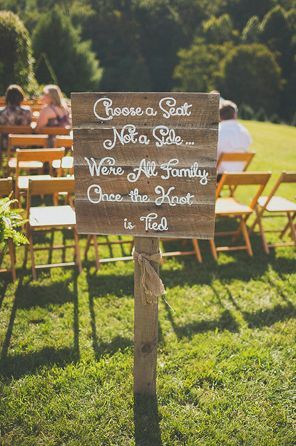 Pinterest is full of cute little rhymes and signs that instruct people to mingle rather than segregate. If the thought of a first dance scares the hell out of you, feel free to skip it. But if you still want to do something special with your new husband in front of your guests, get creative! Do a First Karaoke. Or First Stage Combat. First Book Read Aloud. First Tequila Shot. You do you.